The Nike Golf Dri-FIT Heather Polo Style 474231 is available in Adult Sizes: XS-4XL and comes in Black Heather, Carbon Heather, Light Game Royal Heather and Monsoon Heather. The Heather Polo comes in men’s sizes XS-4XL and is available to purchase in your choice of the following colors: Black Heather, Carbon Heather, Light Game Royal Heather and Monsoon Heather. Stay comfortable before, during and after the round of gofl in this sophisticated style. Dri-FIT moisture management technology helps keep you dry and focused. Contrast stitch details on the seams and collar. Other features include a self-fabric collar, three-button placket and open hem sleeves. A contrast heat transfer Swoosh design trademark is on the left sleeve. Made of 4-ounce, 100% polyester heathered jersey Dri-FIT fabric. 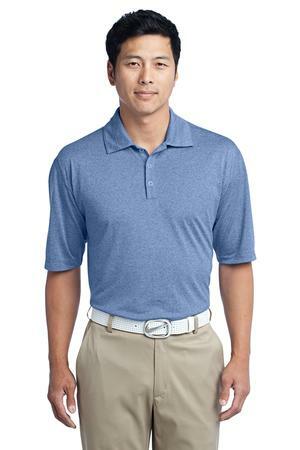 Be the first to review “Nike Golf Dri-FIT Heather Polo Style 474231” Click here to cancel reply.